Here is my list for some of fall's must-haves. I love plaid and always will, it is so comfortable and cozy. I never got this kind of bootie last fall so I really want to try some on this time around. I think they look adorable with jeans, well at least on other people. I am loving all the printed pants in vogue. There are so many great patterns and colors. These are easy to dress up or down and coming from a time of too many skinny jeans these are a welcome and comfortable change. And finally, we have been seeing so many statement necklaces I thought I would make sure earrings get some attention as well. Aren't they beautiful? What else would you add to the list? So much to love for fall - the peplum skirt is great and the cap toe shoe is wonderful!! Hmm, interestingly enough, I like the "low" bootie best! Great options - need to get my plaid on! So many great choices! Loving the burgundy cap toe loafers and those printed pants! I prefer many of the lo options. Suh weet!! Love your blog. Plaids always remind me of my teenage years wearing grungier clothes... Good time!!! 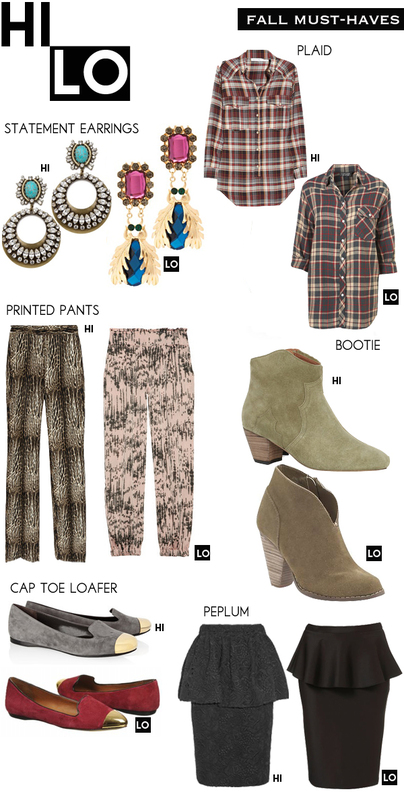 Love those earring lo's and def getting my hands on a pair of booties this season!